PHOTO: Chief James Koser (middle) is flanked by family and fellow firefighters at the 2019 CSFA Hall of Fame Dinner, after receiving a legislative citation from Rep. D.T. Wilson (right). Plantsville – State Rep. David T. Wilson (R-Litchfield) was invited to attend the 2019 Connecticut State Firefighters Association (CSFA) Hall of Fame Dinner on Thursday, April 4 at the Aqua Turf Club. 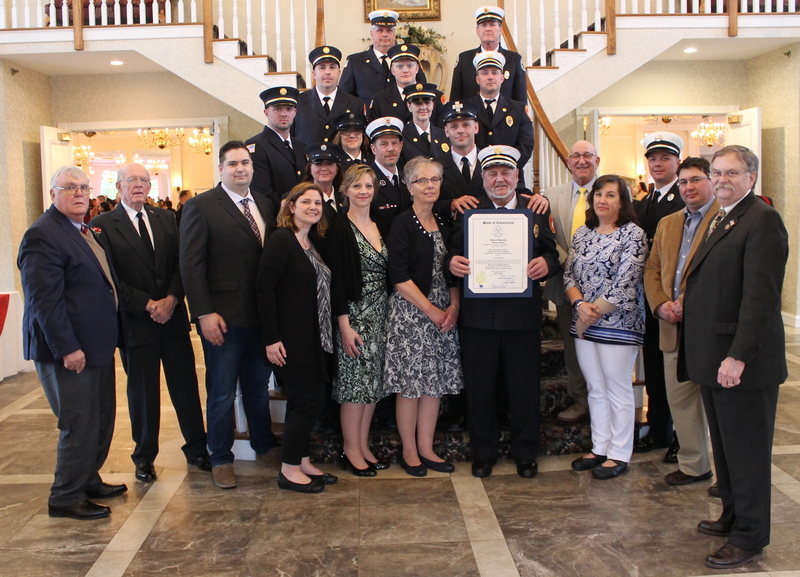 The Litchfield Fire Company Chief, James Koser, was one of eleven members to be inducted into the hall this year. “We are losing a true community leader to retirement after a 58 year career. It’s a bittersweet feeling to see a staple of our town no longer in the head role of the fire department, but the traditions and values set by Chief Koser are most certainly going to be upheld for years to come. I would like to commend him on his wonderful career as a mentor and first responder,” explained Rep. D.T. Wilson. According to the CSFA, Hall of Fame inductees have demonstrated both leadership and motivation, for the betterment of fire service, throughout Connecticut and the United States. All have enriched the organizations that they represented. The CSFA was first organized in 1883 and was officially incorporated by a Special Act of the Connecticut Legislature on March 24, 1885.Currently, CSFA is comprised of 26,625 members representing most than 80% of the firefighters in each of Connecticut’s eight counties.